32 Crazy And Imaginative Fiverr Gigs That People Will Pay You For! Fiverr is usually the place you go to when you need a logo created or a WordPress task completed. Not the place you think of when you need a Hulk Hogan voice over. 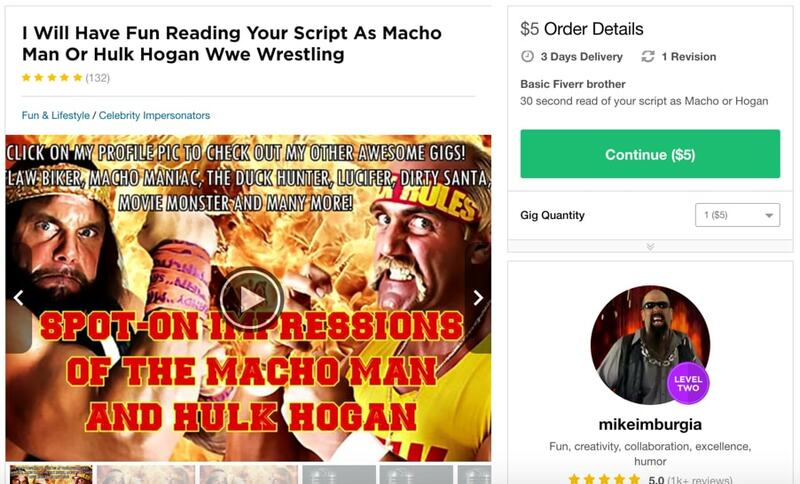 It turns out there's plenty of crazy, unique and darn right wacky ways to make money on Fiverr. Some of these gigs below have had hundreds and even thousands of orders. Maybe you could offer something unique as well? I've scrolled through the Dark corners of Fiverr to see what crazy gigs were available and I've listed them below. Have fun checking them out and don't be surprised at how wacky some of them are. If you can draw cartoons then why not offer gigs like this one. This Gig charges from $15 all the way up to $75 for one cartoon portrait. Some people do this for fun so it's pretty cool you could do what you enjoy and make money doing it. If you've got a quick wit and a great sense of Humor then why not add some to others more dull work. You can offer gigs to spice up peoples blogs, websites, scripts and more with a bit of Humor. If you good at drawing then this is another great gid for someone who's artistic and creative. Offer unique gigs as a children illustrive. Get $30 – $130 per gig! Who the hell thinks of these gigs! You can create wacky dog videos and get paid. Then a message goes along the video that says the translated version of what he said was “Go Shop At Dexters Car Lot”, or an equivalent message. They use the same video each time it's just different text over the video promoting different business or messages etc. Pretty unique and people clearly live this gig with 27 5* reviews. Another gig for the artistically gifted. If you can draw a good monster then you're in luck as people will pay for that service on Fiverr. I wish I could draw as this looks like a cool gig to offer. Another wacky video that people are paying for. You can get dressed up as Flowerman and say personal messages to people like the guy is this gig. It doesn't have to be a Flower customer though, whatever costume you have you could probably offer a similar gig. How funny (and random) would it be to get a birthday message from someone dressed up as a weird flower guy. This guy made up a persona called Mr. Baloney Macaroni. Absolutely weird to watch but funny as well. Another one of those gigs where people want to create a funny message to send to friends and family. Did somebody say weird science? If you do a good mad scientist then there's a unique segment in the market for you. As of writing this, this gigs has had 42 gigs ordered with 5* reviews. Bit of a prankster? Like playing tricks on people? Then check out these gigs. People are paying people to do pranks or do something fun. If you did this you could also upload your videos to Youtube and make a prank channel at the same time? Not the craziest gig on here but unique to Fiverrs usual logo creation gigs. If you know how to create meals plans then this is a good way to offer that service. Believe it or not, I used to be a personal trainer many moons ago and it would have never crossed my mind to offer diet plans on Fiverr. The initial gig is just a $5, but with the extras offered it could be a nice payment per gig. Think of yourself as a magic Sorcerer? Then check out this gig. You can pay people to cast love spells with white magic. Sounds a bit spooky to me but I love the uniqueness of this gig. Just look at how many people have ordered this gig! Forget life coach, try gaming coach! Another great gig on Fiverr. If you're a gamer and you know what you're doing then maybe offer your services as a gaming coach. I know I need to improve my Fifa skills so maybe I'll hire a coach on here! This is a service that people clearly want and will pay good money for. This gig is $145 and has 250 orders with a 5* rating. Probably a safer alternative than the love spells gig. If you can offer love spells then maybe you can offer money spells as well. The thing that blows my mind the most is, as of writing this, this money spell gig has had 900+ orders at $75 per gig. Fairplay to that gig provider. She found her niche in the Fiverr market and made something happen. Maybe you could do the same? Providing you know how to cast spells that is. Lovely little gig here. Someone offers to trace peoples family tree. She clearly does a good job with 100+ satisfied customers. If this is a bit of you then why not offer this unique Fiverr gig. Own puppets and know how to use them? Maybe you could offer Puppet videos with a unique personal message to people? This gig offers Professional Spokesperson Puppet Video In English Or In Spanish. Dear lord, please forgive me for I have sinned! I know some people will be offended by this gig but still, it's pretty funny and plenty of people will pay for a personalized message from Jesus (well his stunt double that is). If you've got a beard and a white robe then this gig might be for you. There are tons of jobs doing this. I came across this gig when doing research for my article 9 Quick And Easy Ways to Make Money From Home in 2019. Look how many gigs that people are clearly buying are for Celebrity Impersonators. If you can do any unique celebrity impersonations then get on Fiverr and start selling your Morgan Freeman impressions now! How cool is this? You can get a personalized Hogwarts acceptance letter! Such a great gig, which I'm sure there's plenty of Harry Potter fans who'd love to get this as a gift. Do you live somewhere that people may have a hard time getting things from? Do you live somewhere that has cool things that people may want that can't be easily found online? This gig offers to buy things from Japan and send it to you. Another totally unique gig to Fiverr. This is quite a handy gig if you have merch you need people to wear. It's not exactly runway modeling but there's plenty of businesses that need images of people using or wearing their products. Got superhero drawing skills? Then your gig will fit in well in Fiverrs illustration category. I actually had a kid in my class at school who could draw wicked cartoon superhero. Who knows maybe he's selling his services on here? This is another one of those gigs that makes me think, who needs someone to create a nursery rhyme for them and pay for it. I don't know who, but there are people willing to pay for it. If you can compose a cool nursery rhyme or two then post your gig to Fiverr. A bit like the last gig but writing fun children's stories. I know there's probably a lot of people out there who like writing kids stories and believe it or not, people are looking for this on Fiverr. This is one where I've paid people to do this for me. Writing product descriptions is not my thing and I could spend an hour writing and rewriting a short product description. If you can write something fun that sells then you can offer this as a gig on Fiverr and charge good money for it. This gig is $125 for a bundle of 10x 100-word product descriptions. You could probably do that in a few hours. Not bad pay for a few hours work! Ho ho ho this is bad Santa and I've got a message for you! This is a seasonal gig which I bet is super popular just before Christmas. Put this down as another wacky Fiverr gig people are willing to pay for. When you need a custom crossword puzzle, where do you go? Fiverr of course! When I told you there were crazy and unique gigs on Fiverr you could make money from, I bet you did think of crossword puzzle architect. Don't just sell graphic design gigs, offer a more niche version like creating great Youtube covers. This is another gig I've personally paid for. I bet there's plenty of people who need this regularly as well. If you can sing, then get paid to wish someone happy birthday by singing. Imagine you open up your email and it's a link to a video of someone who's a great singer singing happy birthday to you. It's would be a nice unique gift. It'll be prob the easiest $10 you'll ever earn. Can you smell what da rock is cookin? I can and it's wrestling gigs. I'm sure by now nothing is surprising you as to what can be offered as a gig on Fiverr. This guy offers all sorts of impersonations on his other gigs. If there's any impersonation that you can do then you should defo give Fiverr a go. I mean who actually comes to Fiverr to get socks designed? Well as of writing this post 135+ have paid to have this service done. If you're a graphic designer, Instead of offering design services, why not create dozens of unique jobs like this that will draw people in from all angles. When you're just a designer in a sea of designers who's gonna notice your gig. When someone comes to Fiverr looking for Sock designs I bet there isn't too many offering this gig even though all the designers could offer this as a service. It's all about the angle you offer your services. Speak another language? Then you can do quick translation jobs on Fiverr to earn some side income. This is a great opportunity if you speak and write a few languages. A perfect way to be able to earn a few hundred bucks a month as a side hustle. The ultimate list of crazy and unique Fiverr gigs. Sometimes you need to think outside the box when it comes offering your services. And that's exactly what the people above have done. If you want to check any of these gigs out or offer your own gigs then head over to Fiverr here. Thanks and feel free to give this post a pin if you want to come back and check it out another time. Honestly, I laughed out loud on so many of these gigs. Some of them are plain hilarious while other are creativity at its best level. Thanks for sharing an amazing article.